Objectives: Diagnosis of ovarian cancer is associated with adverse prognosis caused by late diagnosis, a high recurrence rate and a fast emerging chemotherapy resistance. The goal was to identify a novel therapy approach for treatment of especially chemo resistant ovarian cancer by combination of a PD-1/PD-L1 and an ERK inhibitor. Methods: After single and combined inhibitor treatment the concentration of 50 % reduction of cell viability (IC50) was determined in HEY and Hey-Cis by MTS assay. Impact on MAP kinase pathway was checked by immunoblot. QPCR experiments were performed to prove expression ratios of PD-L1, IL8, IL6, cFos, FosL und VEGFC after treatment. IL8 secretion was checked by ELISA. 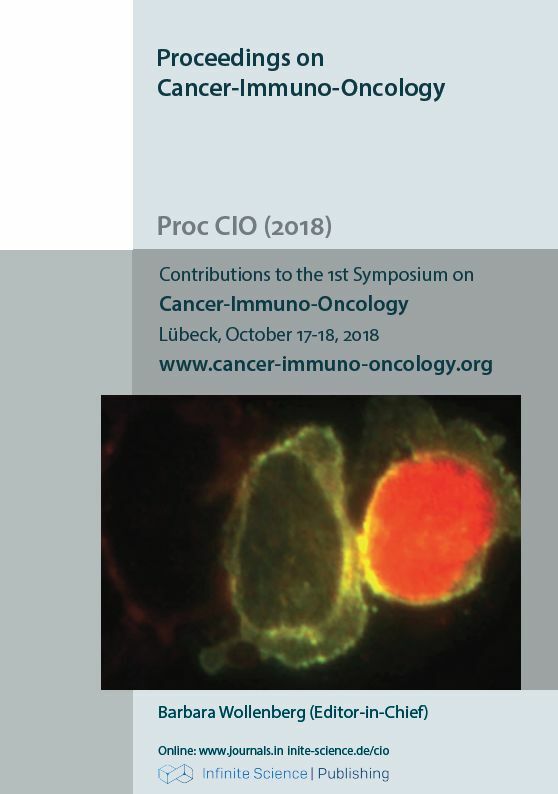 Results: The PD-1/PD-L1 inhibitor provoked 50 % reduction of cell viability with concentrations of 3.92 μM in HEY and 4.03 μM in HEY-Cis. For the ERK inhibitor IC50 values were determined of 4.73 μM in HEY and of 1.96 μM in HEY-Cis. Combined treatment effected a synergistic inhibition of proliferation. ERK and S6 were dephosphorylated and the expression of c-Myc was decreased by single and especially combined inhibitor treatment. Gene expression of IL8 and IL6 was strongly increased in HEY while diminished HEY-Cis after ERK inhibitor treatment. Additionally, cFos, FosL and VEGFC expression were reduced in both cell lines. The ELISA confirmed a strong secretion of IL8 in HEY cells after ERK inhibitor treatment. Conclusion: Both inhibitors reduced cell viability and acted synergistically when combined. Intracellular changes mainly occurred by the ERK inhibitor and provoked a stronger effect on HEY-Cis. The reduction of genes involved in inflammatory processes in HEY-Cis could suggest the use of a MAP kinase inhibitor combined with an immunotherapeutic therapy approach by existing Cisplatin resistance.